In saucepan, add oil, onion, and garlic and cook about 2 minutes, stirring occasionally. Add quinoa, sun-dried tomatoes, oregano, salt and water. Heat to boiling. Cover; reduce heat. Simmer 8 minutes. Uncover, stir in broccoli. 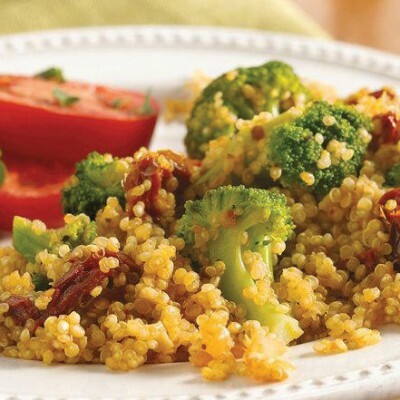 Cover; cook 7-8 minutes longer or until broccoli and quinoa are tender. Sprinkle with parmesan cheese, if desired, and serve.